Google Voice for Android has an update that offers users two new widgets to speed up access to certain features. The Google Voice Inbox widget brings your voicemail and text messages to the home screen of your Android device. You can go through your inbox to select messages, and if you select a preview to read, it can be opened up in the app. The Settings widget gives you 4 different functions. You can compose and send free text messages and divert unwanted calls to Voicemail by selecting "Do Not Disturb". While on the move, change which calls will go through Google Voice-all of them or just a selected few. And by clicking on the Google Voice icon, you get access to the full Google Voice app. 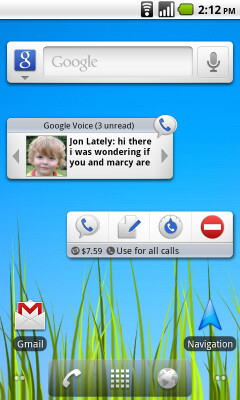 The widgets are part of the updated Voice application, which you can download today from the Android Market. While Google Voice is free to anyone in the U.S., you must have a valid Voice account to use the widgets. To add them, press the menu button from the home screen and select "Add>Widgets>Google Voice Inbox or Google Voice Settings". You can also find out your credit balance to let you know when it's time to add some funds.